Nanogels designing for effective treatment of eroded cervical dentin lesions. Polymethylmetacrylate-based nanoparticles (NPs) were doxycycline (D), calcium, or zinc loaded. They were applied on eroded cervical dentin. Treated surfaces were characterized morphologically by atomic force and scanning electron microscopy, mechanically probed by a nanoindenter to test nanohardness and Young’s modulus, and chemically analyzed by Raman spectroscopy at 24 h and 7 days of storage. Data were submitted to ANOVA and Student-Newman-Keuls multiple comparisons tests. Dentin treated with Zn-NPs attained the highest nanomechanical properties, mineralization, and crystallinity among groups. Nanoroughness was lower in Zn-treated surfaces in comparison to dentin treated with undoped gels. Dentin treated with Ca-NPs created the minimal calcification at the surface and showed the lowest Young’s modulus at peritubular dentin. Intertubular dentin appeared remineralized. 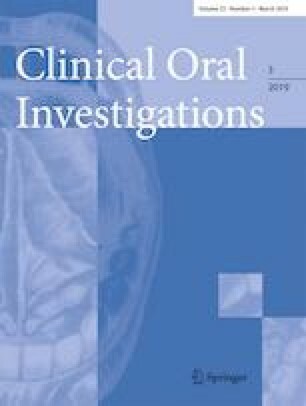 Dentinal tubules were empty in samples treated with D-NPs, partially occluded in cervical dentin treated with undoped NPs and Ca-NPs, and mineral covered when specimens were treated with Zn-NPs. Zn-loaded NPs permit functional remineralization of eroded cervical dentin. Based on the tested nanomechanical and chemical properties, Zn-based nanogels are suitable for dentin remineralization. The ability of zinc-loaded nanogels to promote dentin mineralization may offer new strategies for regeneration of eroded cervical dentin and effective treatment of dentin hypersensitivity. This study was funded by the Ministry of Economy and Competitiveness (MINECO) and European Regional Development Fund (FEDER), grant numbers MAT2014-52036-P and MAT2017-85999-P. Authors do not have a financial relationship with the organization that sponsored the research. All procedures performed in the present study, involving human participants, were in accordance with the ethical standards of the institutional research committee (405/CEIH/2017) and with the 1964 Helsinki Declaration and its later amendments or comparable ethical standards. This article does not contain any studies with animals performed by any of the authors.